Facebook is a social networking service that was created by Harvard student Mark Zuckerberg in 2004. Initially designed as a networking tool for Harvard students, it quickly spread to other schools and was finally opened to the public in 2006. Facebook is now, by a very wide margin, the biggest social network worldwide. 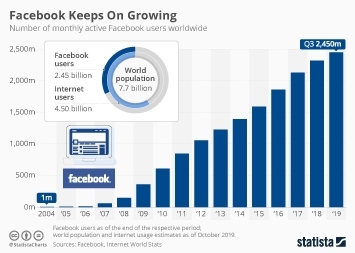 As of the fourth quarter of 2018, Facebook had more than 2.3 billion global monthly active users with a cumulative total of 2.7 billion users accessing any of the company's core products Facebook, WhatsApp, Instagram, and Messenger on a monthly basis. In 2018, Facebook generated 55.8 billion U.S. dollars in revenues, most of which derived from advertising sales. The amount of data the company collects from its users enables it to sell well-targeted advertising space, which is why Facebook’s advertising business is expected to grow vastly in the years to come. Facebook filed for an initial public offering in February 2012 and made its stock market debut on May 18. Raising 16 billion U.S. dollars at a valuation of 104 billion U.S. dollars, Facebook's IPO was among the largest IPOs of all time, dwarfing those of other Internet companies, such as Google and Amazon. Facebook allows its users to create their own Facebook page, add friends and share personal updates and photos. According to Facebook user statistics, a very popular feature of Facebook is the “like button”. Designed to facilitate feedback and recommendations to friends, it is now integrated into virtually every major website, especially those offering content. The “like button” also opened the door for marketers to benefit from Facebook’s popularity. Facebook enables brands to address their fans directly, which is why marketers put a lot of effort into generating Facebook fans. Major companies like Disney, Coca Cola and Nike have tens of millions of Facebook fans according to this brand ranking. In recent years, Facebook has repeatedly drawn criticism for its stance on user privacy. The terms of privacy and its controls have often been tweaked and are regarded as overly complicated by many users. A survey among internet users in the U.S. showed that many of the respondents were very concerned about the privacy of their personal data on Facebook and have taken steps to reframe their relationship with the social network. One of these steps was sharing less content with friends and followers due to privacy concerns. The Cambridge Analytics scandal of March 2018 was only one of the many instances that made users increasingly wary of the company's handling of their personal data. In September 2012, Facebook purchased photo-sharing app Instagram for 1 billion U.S. dollars. Instagram grew into a veritably social media powerhouse with more than 1 billion monthly active users as of June 2018, push it into to elusive club of the four Facebook properties with more than 1 billion MAU. Other notable acquisitions include VR gaming headset Oculus Rift and mobile messaging app WhatsApp, which was purchased for 19 billion U.S. dollars in February 2014.